We got to Vang Vieng not long after midnight after an eventful coach journey where the bus driver insisted on playing local lao music at full blast when people were trying to sleep, then after we had moaned, he pulled over and turned the engine and coach lights off then started to go asleep spread across the front of the coach. After we managed to wake him we found that we were only 20 minutes from Vang Vieng anyway! Our group checked into 3 hostel rooms at Nana's guest house on the main road through town, we were all tired from the journey so just hit the sac. The next day we woke and it was pouring down! But what did we expect for rainy season?! Not exactly the weather to go tubing. I was up for going but some of the group didnt fancy it so we ate breakfast then took a walk through town resulting in us going to a bar, playing pool, drinking beers and downing shots. A very productive day! In the evening we went checked out a few other bars and a club and it got messy. from the board. It was a pretty cool set up! Even though tubing has supposed to have finished it's still going on but not as many bars along the river and minus the swings and death slide. We drifted to the next bar around 4 ish and it was quite chilled sowe had a few more there then set off to try and get our tube back to the office before 6pm to get a full deposit. We failed but it was worth it to see the amazing mountains and scenery whilst driftng down the Nam Song river. And it was the first time I'd actually tubed to the last point! I treated myself to a much deserved chicken baguette from the baguette stalls. For 10,000 kip (around 80p) they're such a bargain! And absolutely delicious!! Most of the group stayed out and we continued the party in some of the bars. The next day we done it all again, well most of the group did and we had another amazing day! This time we spent longer in the first bar and swerved the second bar. The first bar is defo where the party is at! This time we all managed to get our tubes back to the rental office and got our full deposit back! In the evening we went to the irish bar. The humidity was so high and before long it started to pour down ... very heavy! Not what we wanted as there was a jungle party just outside of town. The rain eased off at one point so we all jumped in tuk tuks and headed to the party. Sure enough the heavens opened and everyone got soaked but the party still carried on with everyone dancing in the rain! as the 4000 islands) to relax and detox! how did you hear about the jungle party? 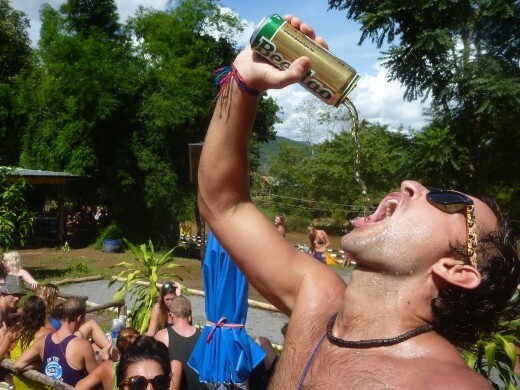 When we backpack we want to go to these crazy parties but how did you hear about it?